PosterOffice The Avengers Infinity War (Advance) Movie Poster - Size 24" X 36" - This is a Certified Print with Holographic Sequential Numbering for Authenticity. 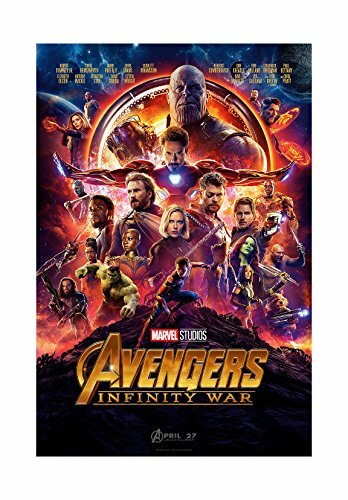 The Avengers Infinity War (Advance Style B) Movie Poster - Size 24" X 36" inches from PosterOffice Amazon store. It does not have title credits and only has the date of release. It is sequentially numbered with a holographic sticker that is logged by PosterOffice to ensure you are actually receiving our product from our store. BUYERS - PLEASE MAKE SURE POSTEROFFICE is the seller in your BUYBOX if you want the actual product listed. This is a Certified PosterOffice Print with Holographic Sequential Numbering for Authenticity. PosterOffice is the original lister of this item. The FIVE STAR feedback you are reading is for the product sold by us. Only the PosterOffice Print is numbered and logged by us before being shipped, proving you purchased an actual POSTEROFFICE print. This is a luster print (not glossy). A great gift for the ultimate Avengers fan. 100% Money-Back Guarantee if you're not happy only if you buy from POSTEROFFICE. Ships rolled inside thick cardboard shipping/storage tube from a warehouse located in the USA. If you have any questions about this product by PosterOffice, contact us by completing and submitting the form below. If you are looking for a specif part number, please include it with your message. Scratch off World Map Poster - Personalized Travel Tracker Map with US States - Country Flag - Traveler Favorite, Funny Scratch, Personalized Decor - Deluxe Black 32.48" x 23.42"